Hey there friends! I hope that everyone here in the States had a fantastic turkey day! It was a low-key holiday for us, which was absolutely wonderful because our low-key times are just about over for the month of December. I am hosting three Christmas parties this week alone. Yes, I may have bitten off a little more than I could chew, but I just love Christmas so much that it's hard to say no to a party! So, we spent the weekend cleaning, decorating inside, and getting the lights on the house. We did NOT set one single toe inside of a mall. I like getting my shopping done before the season gets here so that I don't have to fight crowds. All but three of my gifts are already purchased and wrapped under the tree; and what I don't already have, I am ordering online. Speaking of online shopping, in honor of Cyber Monday I am having a pattern sale! All of my patterns on Craftsy and Etsy are discounted, including my latest- Laundry Money. The sale will run through Wednesday! Happy shopping! 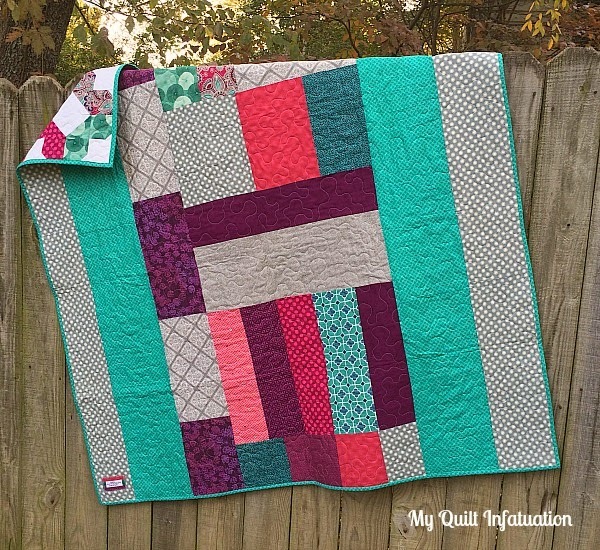 I'm supposed to be using my time wisely cooking and getting my house ready to decorate for Christmas today, but I couldn't resist taking a few minutes to share my Miss Kate coin quilt finish with you! It's not really procrastination though. 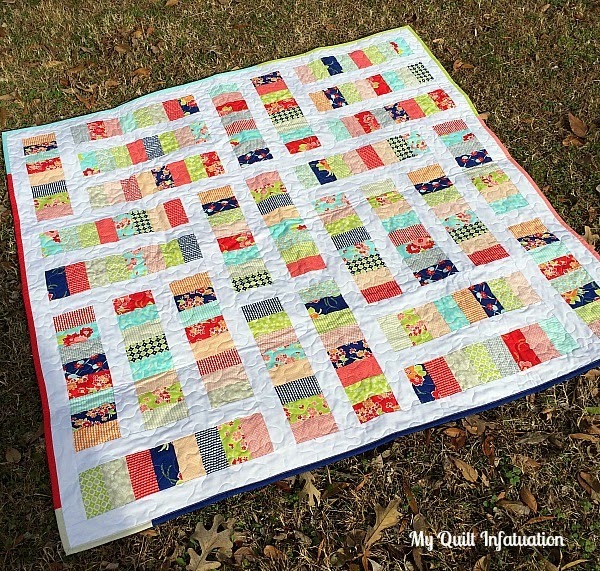 I actually finished this quilt over the weekend, but it was so rainy, I couldn't get any pictures, and of course the days are so short lately that it's almost dark when I get home from school. So today was the first opportunity I had to get pictures of it. There, now that I've justified enough, I feel no guilt whatsoever. I really love these cheery fabrics! I wish it was spring or summer so that the backdrop could show off the colors better. Bonnie and Camille fabrics fabrics just make me smile! This was my first ever jelly roll purchase. Yes, that's right- my very first. 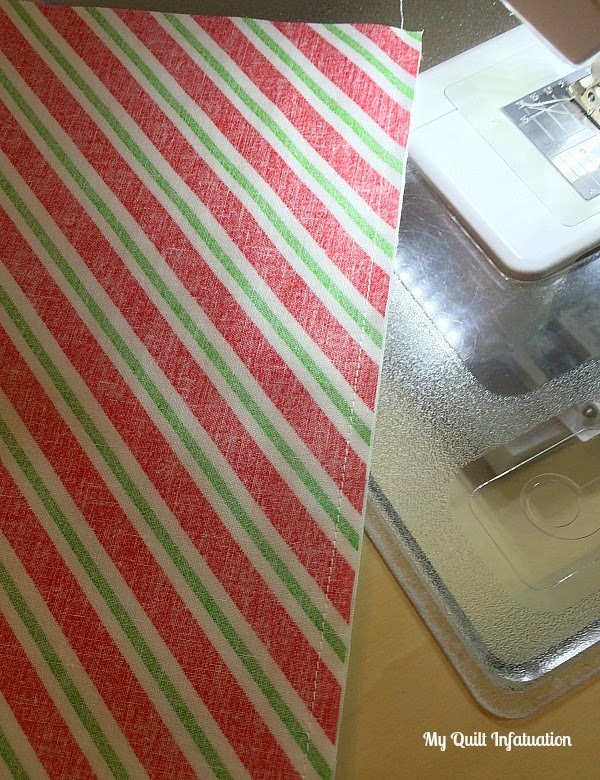 I usually don't buy a lot of precuts (unless you count fat quarters), because I don't always know what to do with them. 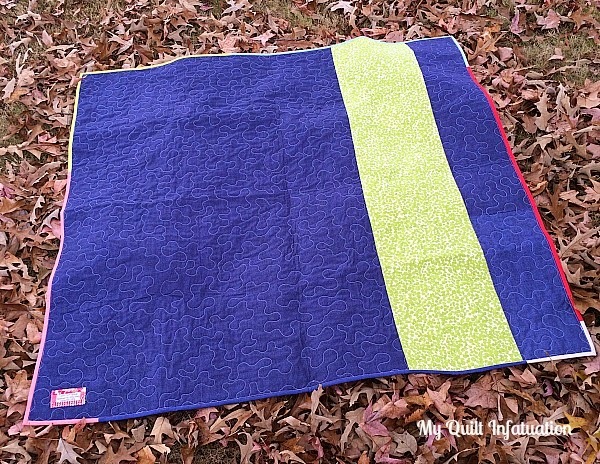 I love quilts with strips, but I usually just use the fabric I have on hand. I have to say that the jelly roll was nice though. 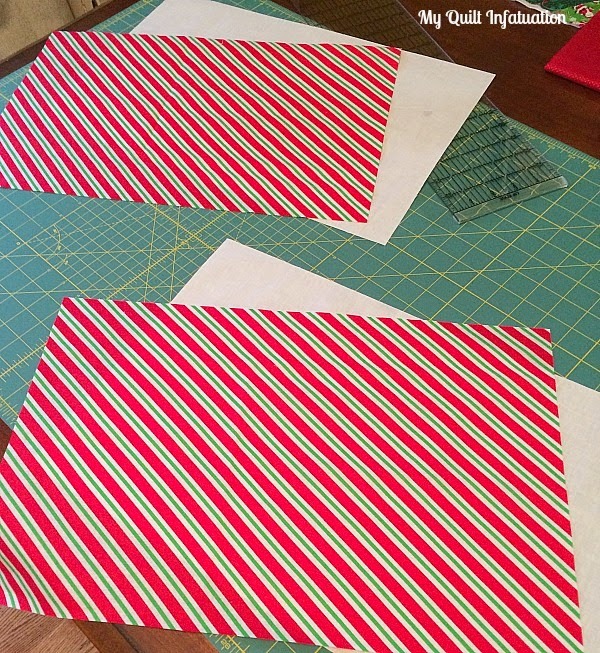 I didn't have to cut the strips, and more importantly, it gave me tons of fabric variety. Of course, that meant that I didn't have leftovers for my usual scrap festival on the back, but that's okay. I like the way the wide green stripe echoes the shape of the coin strips, and the navy blue shows the stippling really well. There was a time when I used to shy away from quilting with contrasting thread in case I made any mistakes, but I've gotten to where I really like the contrast. 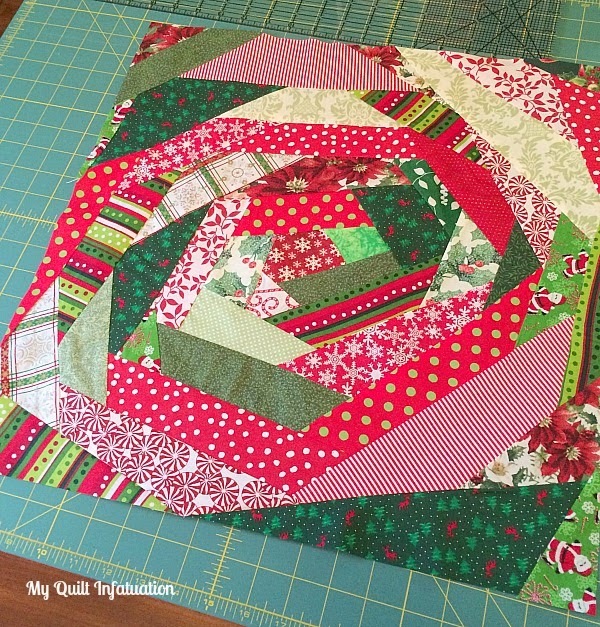 The other great thing is that a jelly roll has built in binding strips! I used all of the solids, and I love the way it frames the coins. Sometimes, I think a pieced binding is too busy, but with all of the white sashing in this quilt, it works. Although I'm calling this pattern Laundry Money since it's a coin quilt, I didn't want to give that name to the quilt itself. 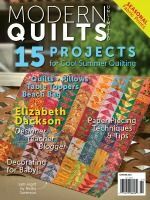 Since "coin quilts" are a quilters' term, I don't see a little girl enjoying that name. 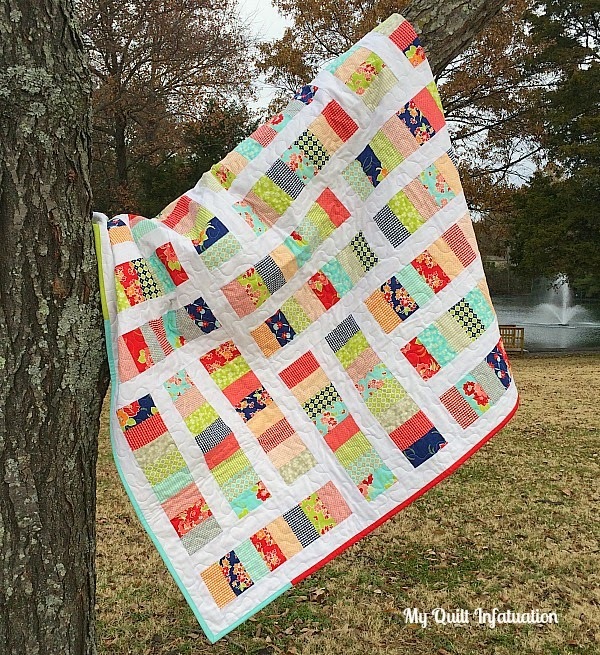 I decided to call the quilt Ticker Tape Parade. I have been putting my time to good use over the last several days, knowing that the holiday season really cuts down my sewing time. I went ahead and finished up my Laundry Money pattern, and it is for sale in my Craftsy and Etsy shops! 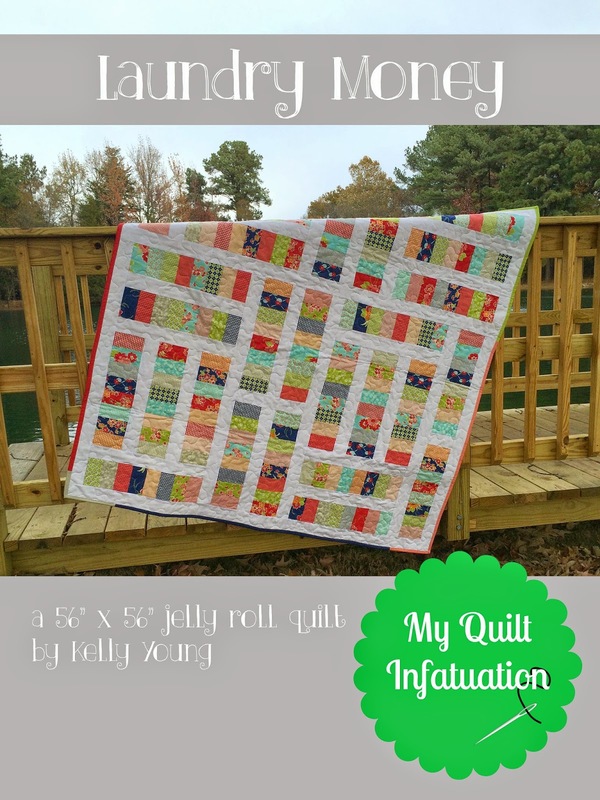 It's a great use of a jelly roll, so I hope you'll check it out! I hope you and your family have a Happy Thanksgiving filled with family, food, and fun! Welcome to another Needle and Thread Thursday, friends! These weeks leading up to the holiday season just fly, don't they? I can't believe that Thanksgiving is in ONE week, and then of course, Christmas will be here in a blink of an eye. By the way, NTT will be taking a break next week for Thanksgiving, but we'll party again the following week on December 4th! 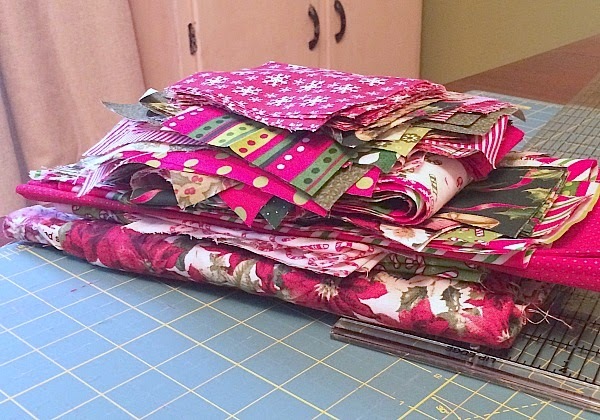 Speaking of the holidays, I owe you a winner for my Christmas scrap fabric giveaway! 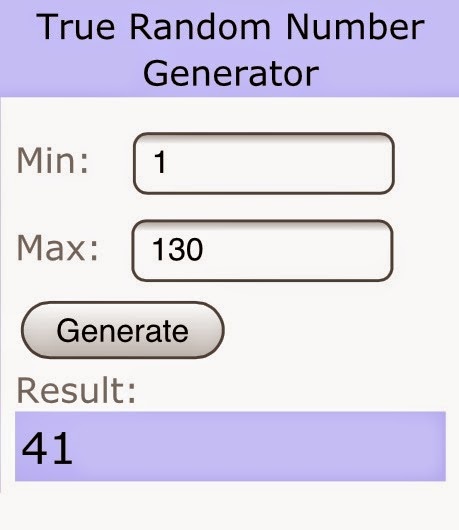 The winning comment was number 41, Dorothy Thornton. Congratulations to you Dorothy. 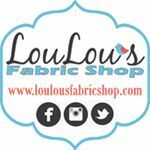 I'm so happy that my fabrics will have a new, loving home, and I can't wait to see what you decide to make with them! 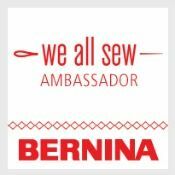 Oh my goodness, y'all are really in full sewing swing lately because last week's party rocked! SO much fabulousness (it's a word!) 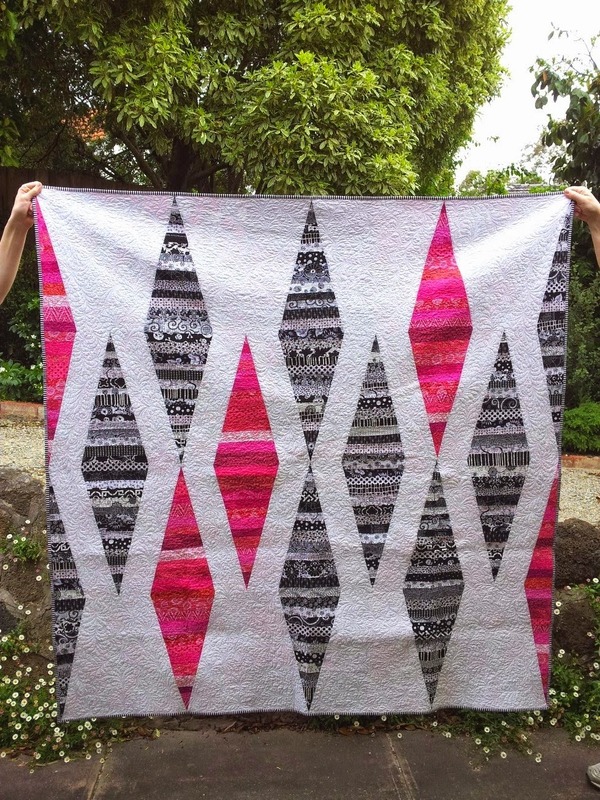 was linked up, like this Endless Chain quilt from Lori at Sew French. This beauty, Lilacs and Lavender, was shared by Diana from Red Delicious Life. 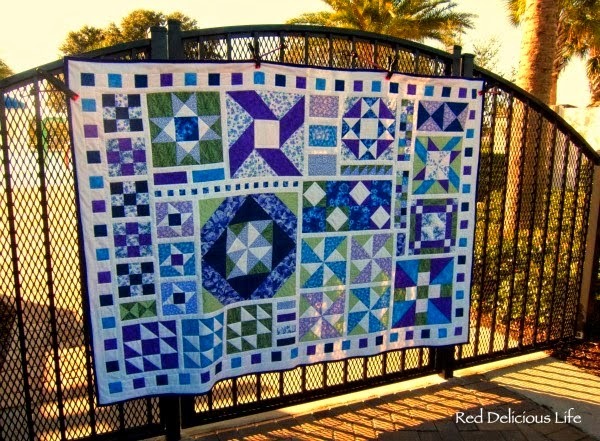 and this Variegated Violets quilt from Tanya Quilts in CO is fantastic! I know I say this often, but it is so true. I can't wait to see what you have going on this week! 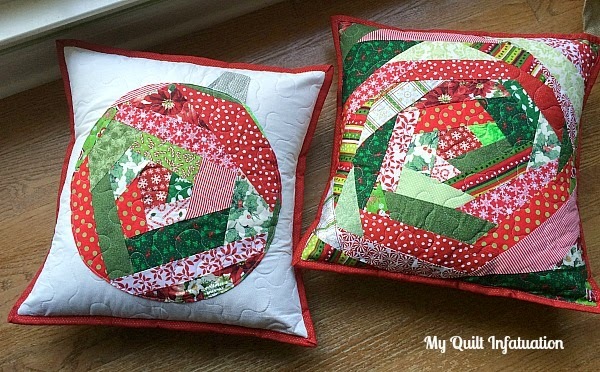 Well, I mentioned at yesterday's NTT that I finished a couple of Christmas pillows as gifts. Here they are! They are 18 inches square. So, here's the thing. I have made so many Christmas projects over the last few years, and each time, I just add more and more to my Christmas stash. At this point, I have a ton of scraps, and frankly, I'm a little tired of them. So, I've decided to give them away. There are seriously a LOT of scraps in this pile of many different prints I've collected. Definitely enough for a lap sized quilt, depending on the pattern, and a few bigger pieces as well. I'm ready to send them off to a new home, and let someone else make some holiday keepsakes with them. To enter the giveaway, just leave a comment to let me know what you'd like to make with them! 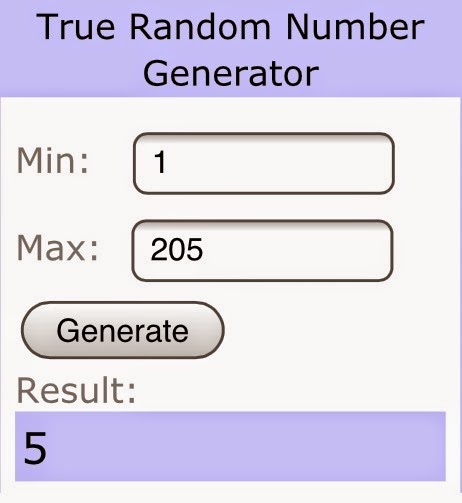 I'll randomly choose a winning number on Wednesday afternoon, and announce the winner at next week's NTT! Good luck to all! This giveaway has now ended, but I host giveaways often, so keep your eyes open for next time! Brrrr! 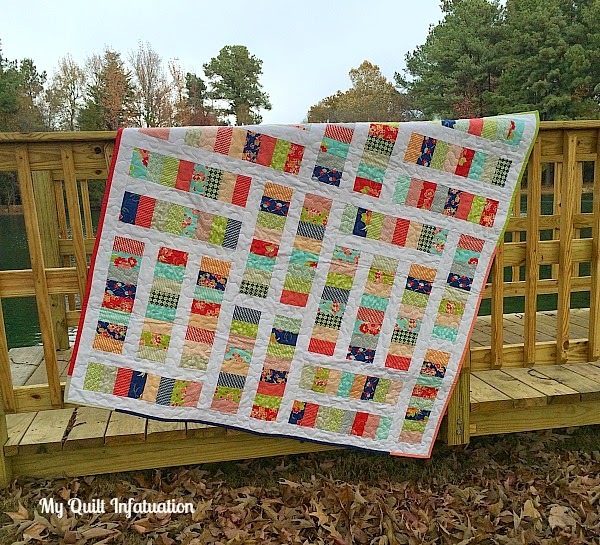 The winter weather has taken hold here, and for me, there is no better weather for quilting! 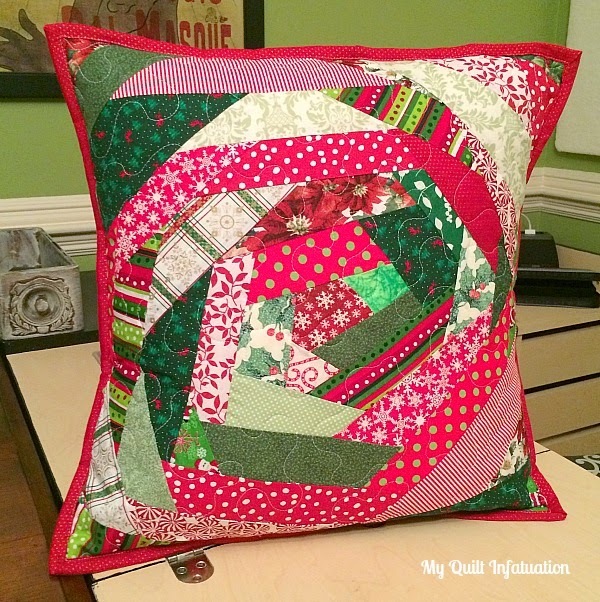 I finished up a couple of Christmas pillows yesterday, and put together a little tutorial for the method that I use, but no new projects since then, so let's jump right in to this week's highlights! 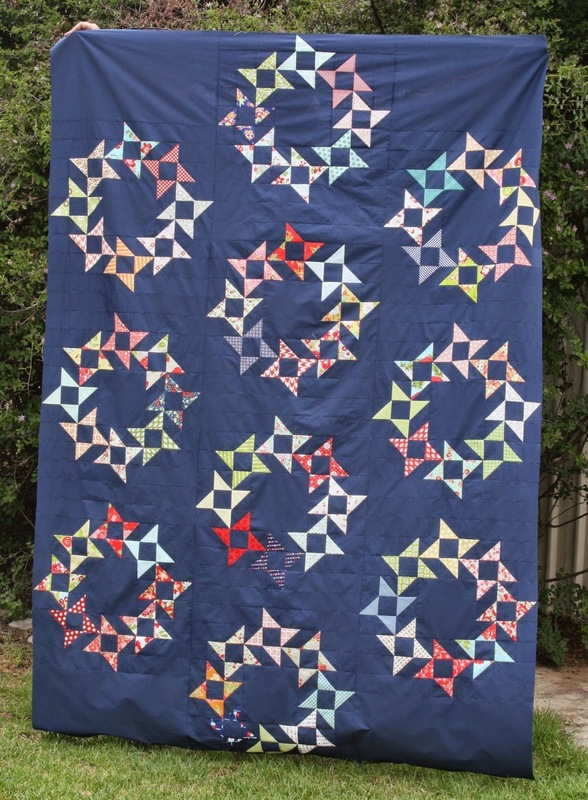 Keera at Live, Love, Sew linked up her pretty Round and Round quilt, and I love the dark background! 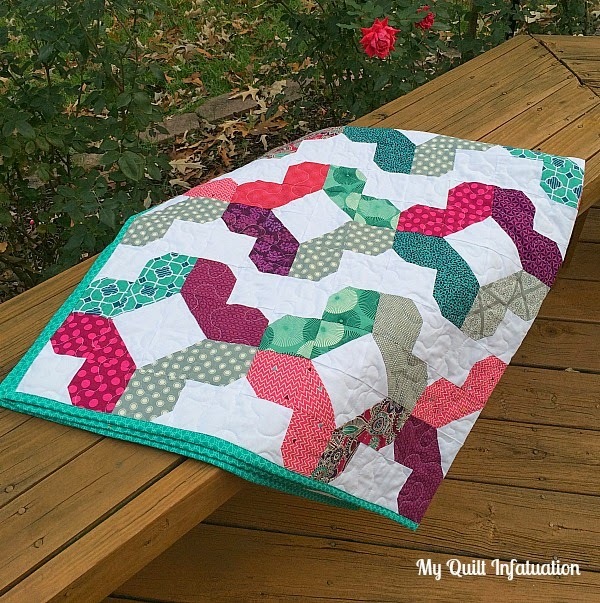 Jennie from Porch Swing Quilts shared her new pattern, Taffy. It's a beauty! 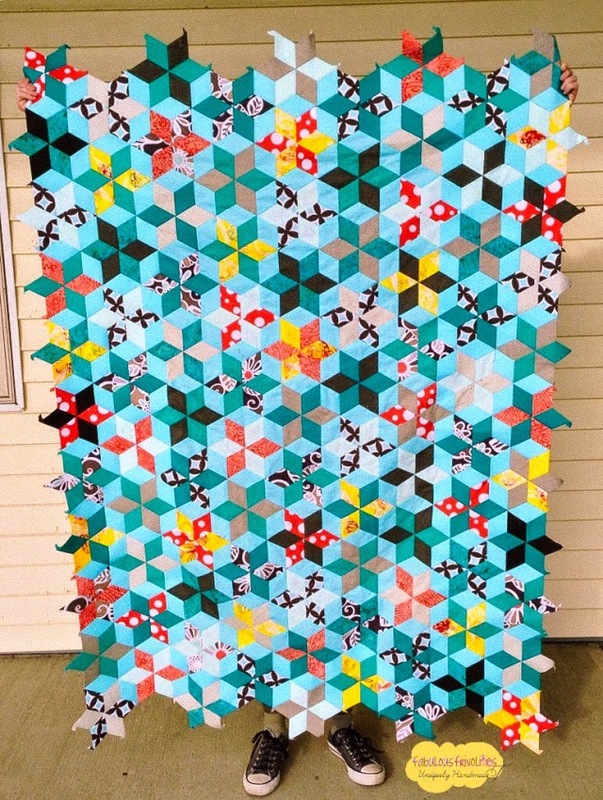 and Curlyque Sue shared this fun diamond quilt! 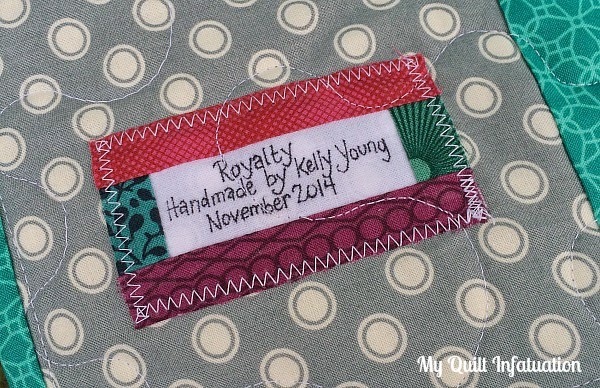 I hope the colder weather has afforded you plenty of inside sewing time, or at least some quilt snuggle time! Time to link up your latest projects! 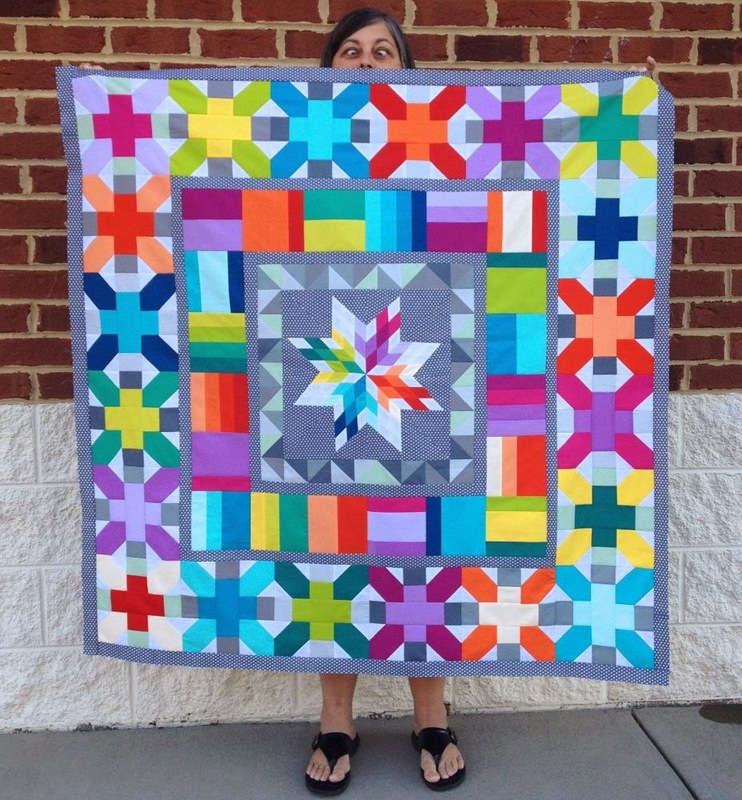 **Oh, and in case you missed it- THANK YOU for voting my Shattered Rainbow quilt the ROYGBIV favorite! It is such a tremendous honor! Hey there friends! The holiday season is upon us, and if you're anything like me, your list includes some handmade awesomeness for the special people in your life. Well, pillows are one of my favorite go-to gifts. There are unlimited ways to personalize them, and they show thoughtfulness without being too time consuming. They are also a great way to freshen up a room's decor without spending an arm and a leg. 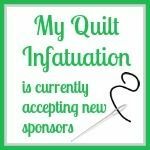 As a quilter, I don't sew a lot of other things like bags, pouches, etc., and frankly, branching out from quilting makes me a little apprehensive (I have an irrational fear of interfacing, but that's another post). 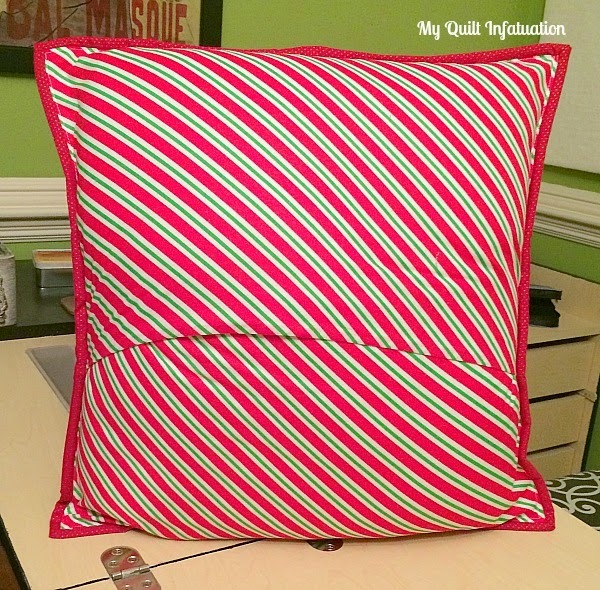 Even though I know there are probably fifty different tutorials for basic pillow construction on the internet, I needed to figure it out for myself. So, I played around with it, and this is the method that I came up with. It is super easy, and really quick. 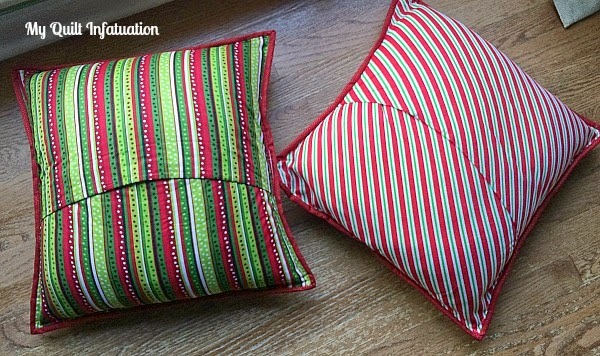 Once you've got the method down, you can modify your fabric requirements to make a pillow in any size! Start off by making the front of your pillow however you like. 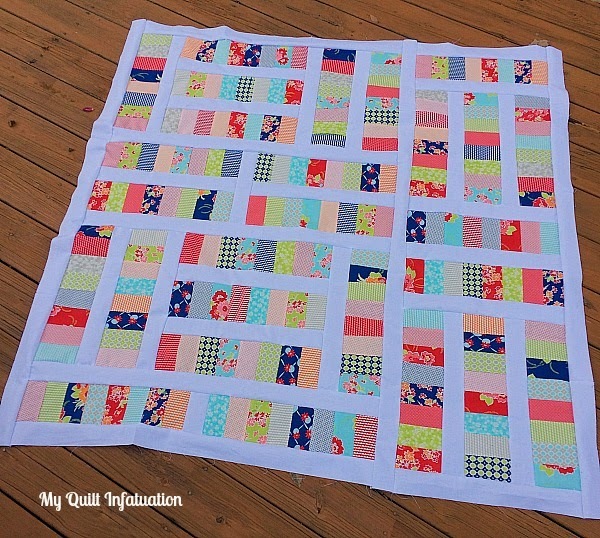 Think of this as a mini quilt, and make it as simple or as intricate as you want. 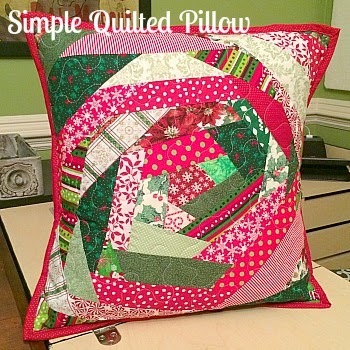 A pillow is a great place to show off applique', regular paper piecing, or English paper piecing- but you can also keep it simple! I decided to do some improv piecing with my scraps. Be sure to give it a good press, and trim to size if needed. 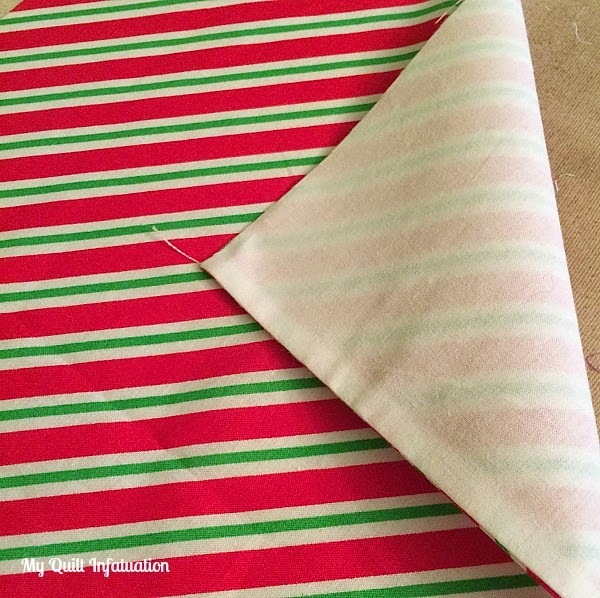 Next, cut your muslin to 18" square, layer your muslin, batting, and top, and baste. A project this small only takes a few pins, and of course there is the bonus that you don't have to crawl around on the floor! Since the muslin will be the on the inside of the pillow, it is okay for this purpose (it is a bit thin for me to use elsewhere). 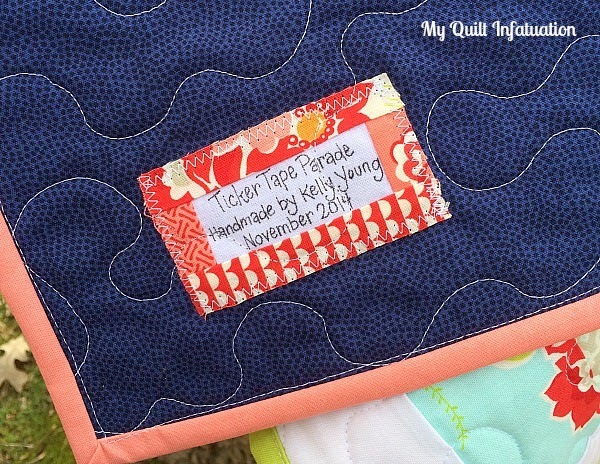 Now, quilt that baby to your heart's content! If you're in a hurry, a quick stipple or some straight line quilting fits the bill, but if you have more time, the sky's the limit. Again, personalize it! Time for the envelope closure backing. It really is easy! From your backing fabric, cut two pieces, 12.5" x 18." Cut two pieces of muslin the same size. You want your two flaps to overlap by several inches so that when your pillow form is inserted, it still stays closed (I like about six inches of overlap). So, since the pillow is 18 inches, we need 24 inches of actual fabric, which means that each piece should be 12.5 inches (including seam allowance). Align the backing fabric with the muslin piece, right sides together, and sew along one long side. 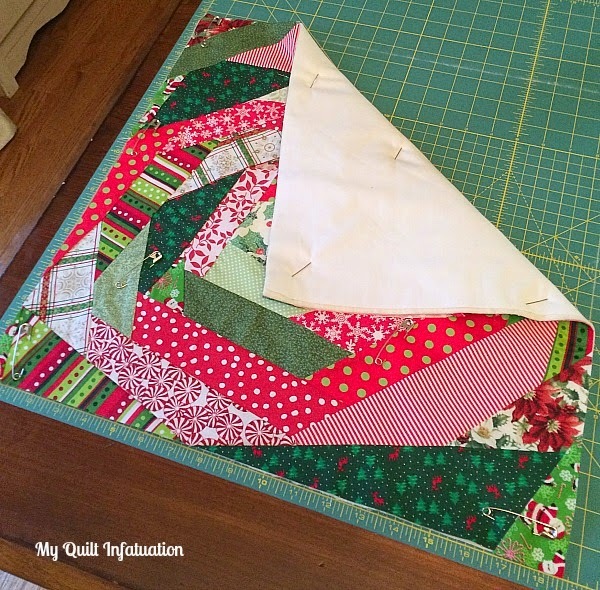 There is no need to sew all four sides, and you'll see why! 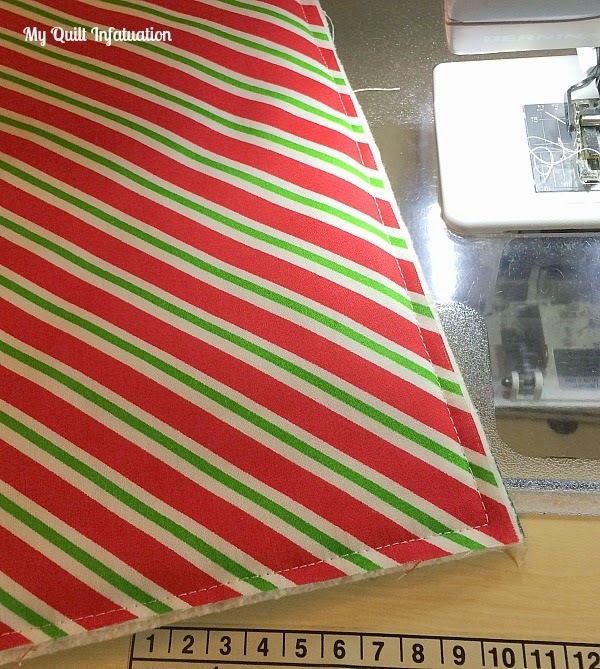 Press the seam, and fold in half with the backing fabric right side out. Press again. Voila! You have one side of your envelope closure! Just repeat with the other piece of muslin and backing fabric. 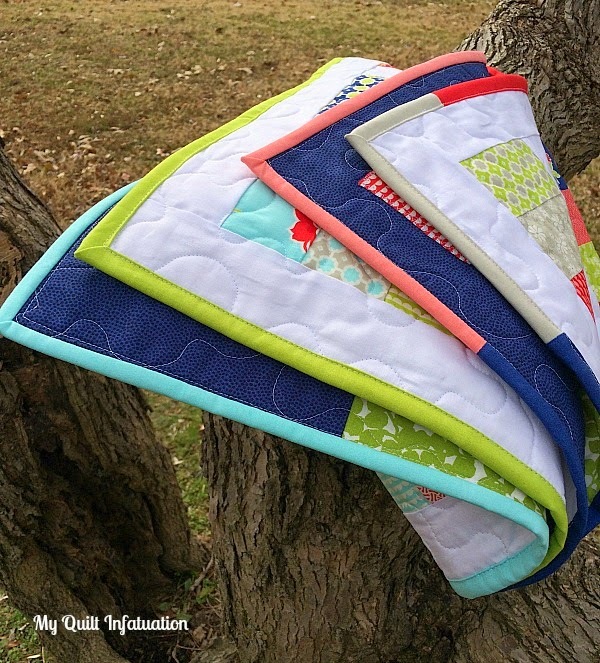 Now it's time to turn that mini quilt into an actual pillow! 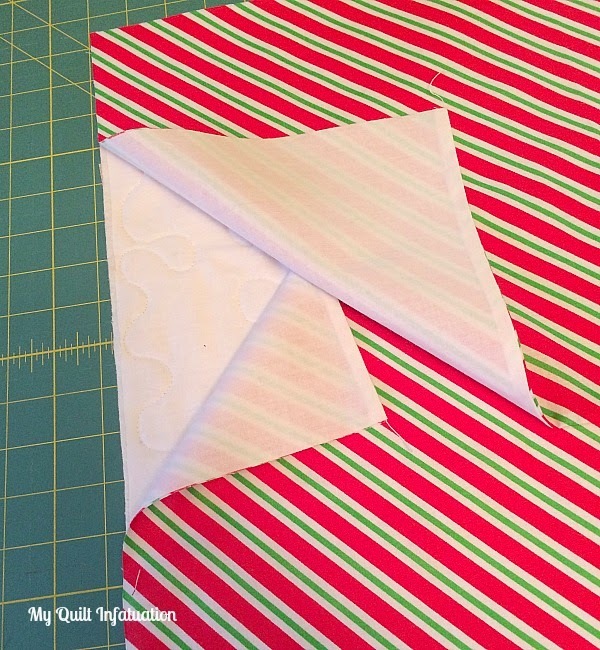 Lay your quilted top face down and layer your envelope closure flaps on top. Align the bottom one with the bottom of the pillow, making sure that the sewn side is toward the center of the pillow. Lay the second backing piece on top. You can pin the three layers together if you desire, but this is so small, I just hold everything in place while I stitch. Use your walking foot, and increase your stitch length just a little bit. I usually set mine on 3.0. Sew 1/4 inch from the edge, all the way around the pillow. It is helpful if you start sewing at a point where your two backing pieces overlap to anchor them, especially if you aren't using pins. See why we didn't need to sew all the way around those backing pieces? They'll get secured in this step. Now, the very last step is to bind your pillow! Binding covers up all of those raw edges, and I think it gives the pillow a little bit of flair. I like pillows that have pretty edges, so binding the pillow is great for form and function. 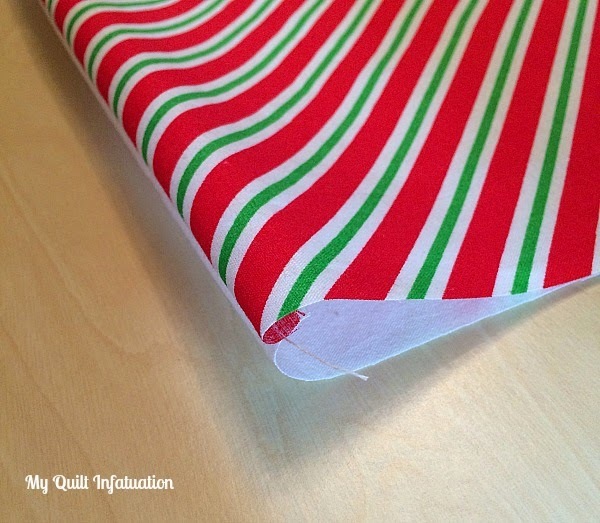 Check out my machine binding tutorial HERE if you're new to quilting and aren't sure of this step. Finally, insert your pillow form, or if you're like me and you always buy a slightly bigger one than your pillow- STUFF it! Be sure you get it pushed all the way into the corners (I just noticed in my final photos that I need to do that a little more). Now you're ready to gift your pillow, or enjoy it yourself! Have fun, and make lots! If you're looking for NTT, you can find it HERE! 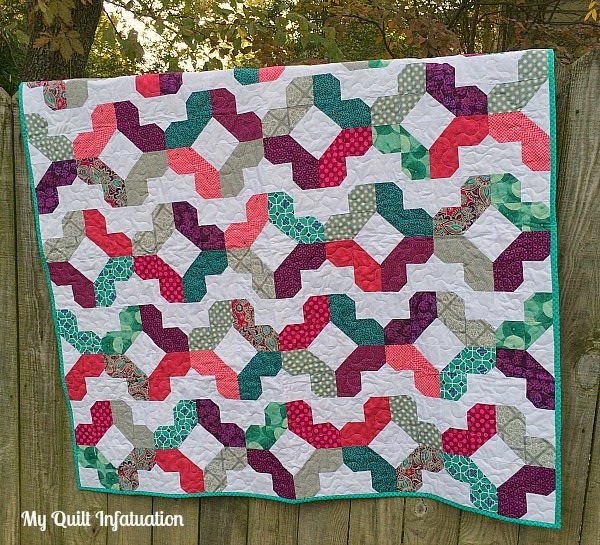 Darn the time change, because even though my latest quilt is all finished and ready to photograph, I haven't had enough daylight to be able to share it with you yet. This weekend I promise to get some really great pics to show you! 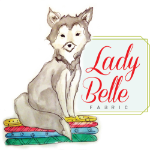 On another note, I am excited to welcome a brand new sponsor- Lady Belle Fabric! Lady Belle is a fairly new shop located in Tennessee that specializes in modern, fun precuts and bundles. They are a husband and wife team that pick out fabric collections together to stock the most fabulous fabrics possible. And my, do they have lots to choose from- Heather Bailey, Bonnie and Camille, Joel Dewberry, Pat Bravo, Tula Pink, and the list goes on and on! I couldn't browse through their shop without choosing a couple of my favorite collections to show you. The colors in Tula Pink's Moonshine bundle are just fantastic! 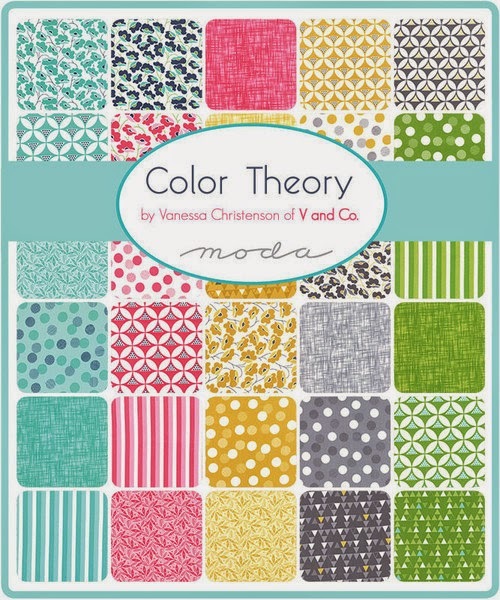 And V and Co.'s Color Theory Bundle is so vibrant and happy! 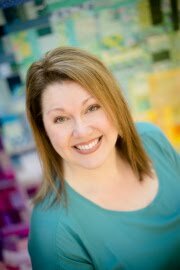 Brooke and her husband, Rob fell in love with modern quilting, and the modern quilting community and started Lady Belle Fabric. 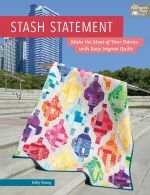 Their goal is to help quilters create beautiful moments where vision, design, and fabric all come together to create something truly special. They named the shop for their beloved Alaskan Malamute, Lady who they lost over the summer. Lady Belle is located in Tennessee, and pride themselves on treating customers with southern hospitality, and generally ship orders out the same day! As a special treat for my readers, Lady Belle has created a special sale code for 20% off of your entire order! 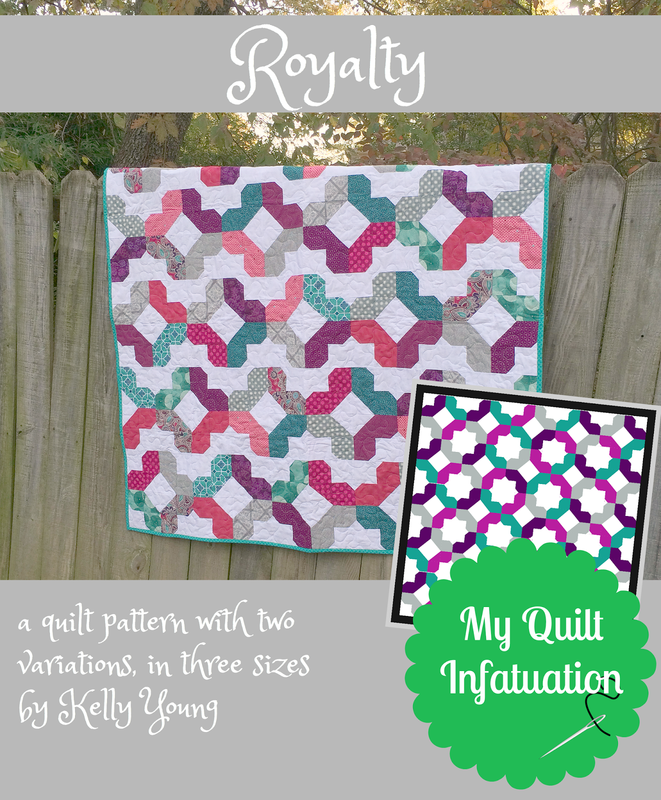 The coupon code is quilt infatuation, and will run throughout the next week! Oh, and how could I forget! They are also having a Sample Spree right now, selling some of the goodies they got at Quilt Market! 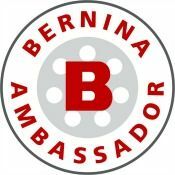 Use the button below to check them out! 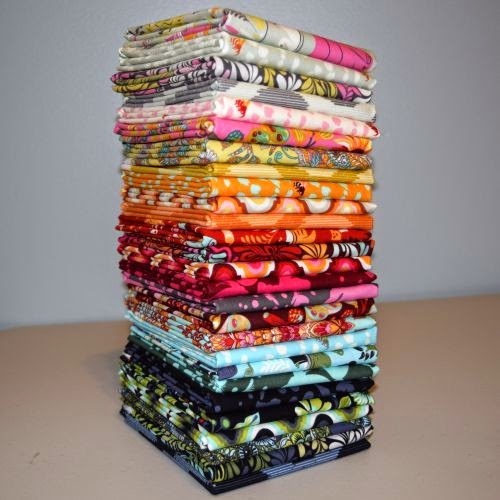 It's NTT time y'all, and that means that it's time to announce the winner of the Up Parasol bundle from Shabby Fabrics! 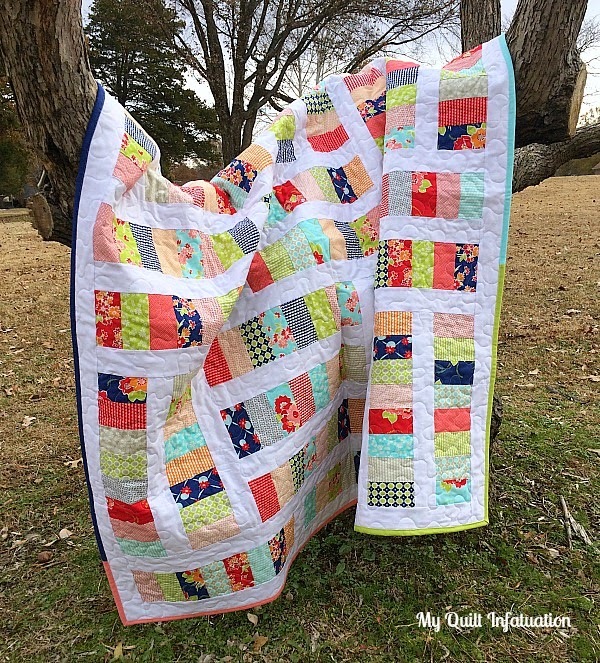 Congratulations to Tanya Quilts in CO, comment number 5. I'll be contacting you by email soon! 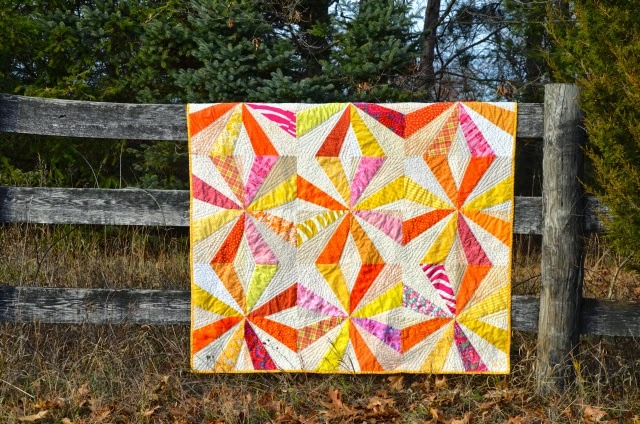 I made a quilt with some of these on commission I would love some for myself! I have made a bit of progress on my latest quilt, but no photo to show for it. I got the backing sewn together and basted it last night. Although it is one of the least interesting steps in the quilting process to show, it feels like a big accomplishment because I really dislike the basting process. So, without further ado, check out some of the awesomeness that was linked up at last week's party! 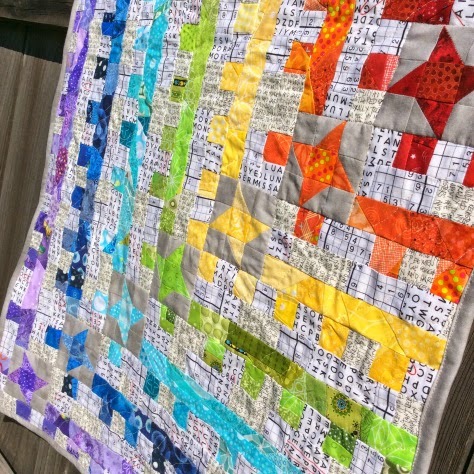 Take a look at this fabulous rainbow mini made by Lori of Crossquilt. Lori is in my guild and was at my house last weekend for our sew-in, and I had the pleasure of seeing this one in person. It really is stunning! 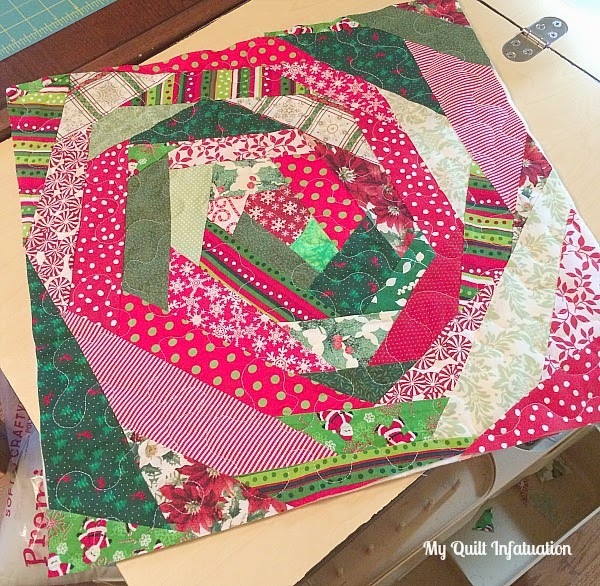 Paula, The Sassy Quilter shared the progress on her Aviatrix Medallion quilt. I LOVE the bright colors against the gray background! 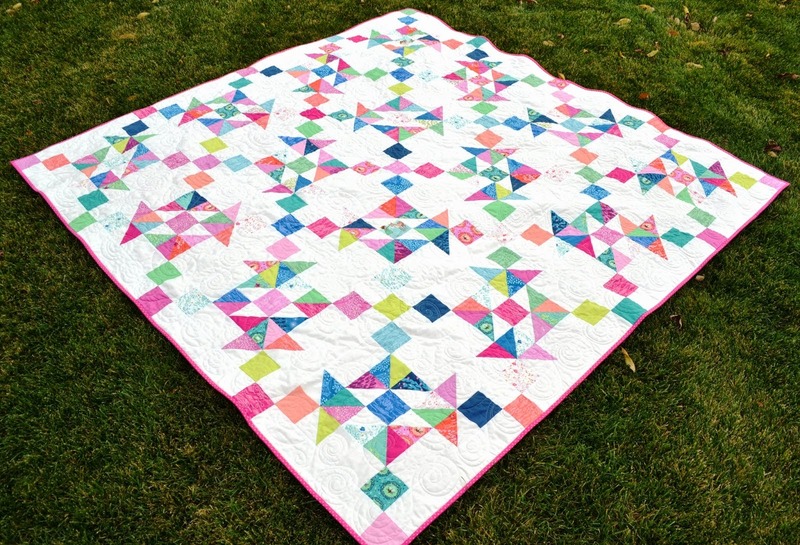 and just look at this EPP beauty from Fabulous Frivoloties! Oh my, I know that was painstaking work! It's amazing. You all continue to inspire me week after week! Time to link up your projects this week! 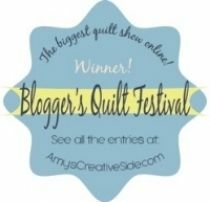 *Oh, one more thing before we party- the time to cast your votes in the Blogger's Quilt Festival is almost up! I would love for you to vote for Shattered Rainbow in the ROYGBIV category. You can vote HERE!